Hankyu Travel Support should immediately compensate unpaid overtime wages and pay the same amount of fines! The company is not to include overtime hours in regular work hours. Tokyo District Court ruled as such on May 11 in the lawsuit filed in October 2008. The plaintiff (a member of National Union of General Workers Tokyo Tobu) claimed that the company failed to pay overtime since the hours were included in the regular work hours. The court dismissed all the defendant’s claims as it stated that temp workers must be paid the hours they put in and not have the set pay that includes overtime wages. 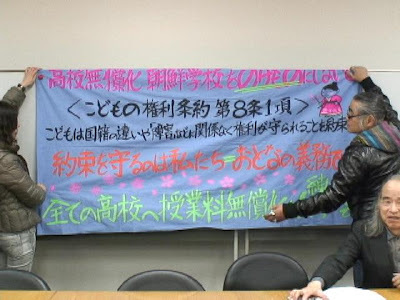 The court also ordered that the company pay the total of 562,930 yen demanded by the plaintiff and the same amount of compensation as fines. 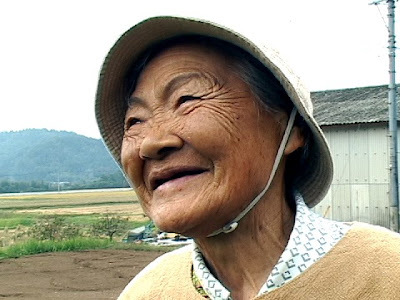 “No Time for Dying—Sumiko Masunaga, 86,” produced by Video Press, was to be screened on May 12 in Tokyo’s Nakano Ward, prior to enactment of law to revise Japan’s constitution. Sumiko Masunaga (photo) was made to believe she was one of “Emperor’s child” by militaristic education and holds bitter memory of encouraging soldiers to head to the battlefield. 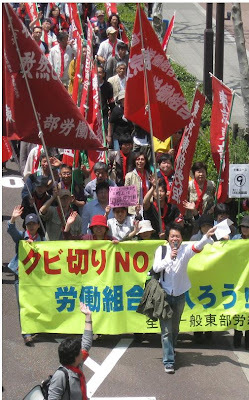 She established the first post-war labor union for nurses and midwives at Toyoda Kariya Hospital in Aichi Prefecture in 1970s. 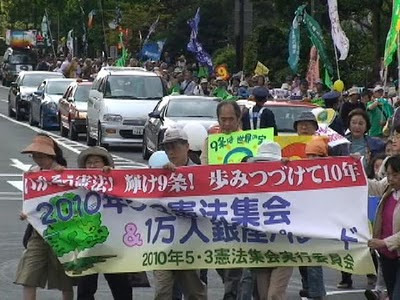 The 145-meter-tall born-activist adapted a death-row inmate and became active in amnesty, anti-death penalty movement, support for Japan Railway workers labor dispute and protecting Japan’s constitution. At the movie screening, she discussed needs of anti-war movement and protest against revision of Article 9, the pacifist article, with former imperial soldier, Ichiro Koyama. 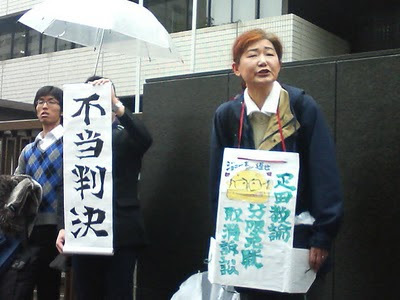 Tetsuya Kuroyabu (photo/ freelance journalist and member of Union Nettsu) won the lawsuit on April 27 at Tokyo High Court, which upheld the lower court’s decision. 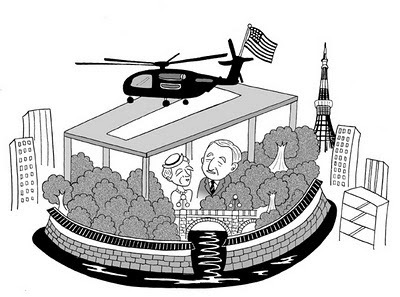 The high court dismissed the plaintiff’s appeal. 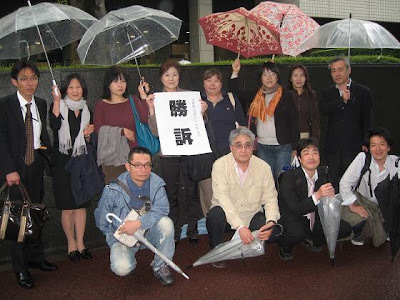 Yomiuri Shimbun West Headquarters sued Kuroyabu for defamation. 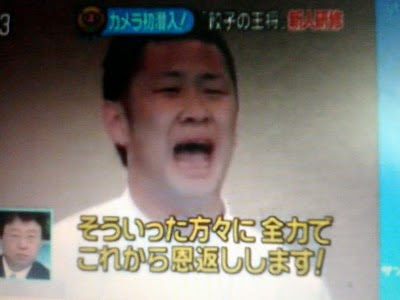 This is the second time Kuroyabu won. He was sued by Yomiuri for violation of copy right. 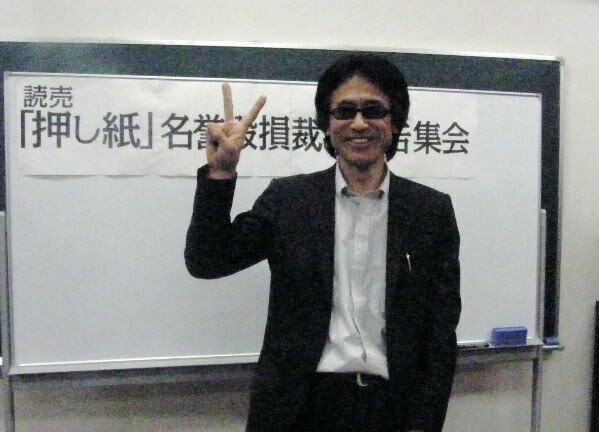 But he has another court case remaining, where Japan’s largest newspaper claimed he and a weekly magazine, Shukan Shincho, defamed the company’s reputation by reporting on forcing newspapers to distribution centers. 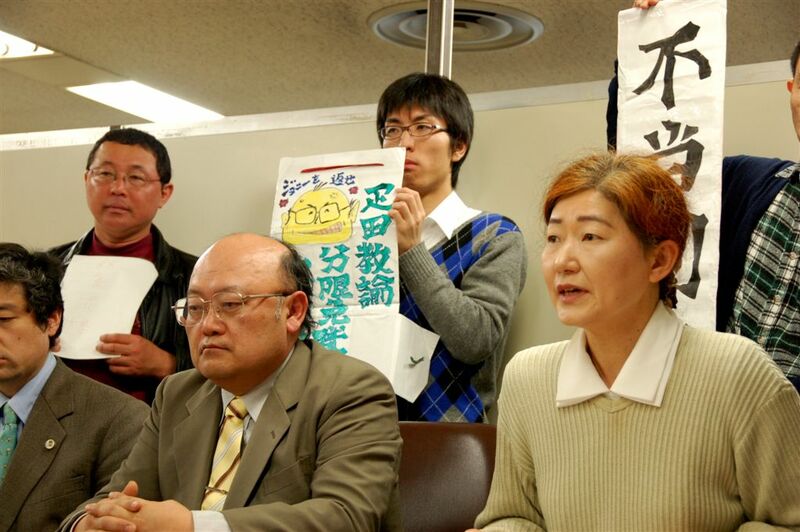 His lawyer plans to file a criminal lawsuit against Yomiuri for forging facts during the lawsuit on copy right, as well as request to dismiss the plaintiff’s attorney. 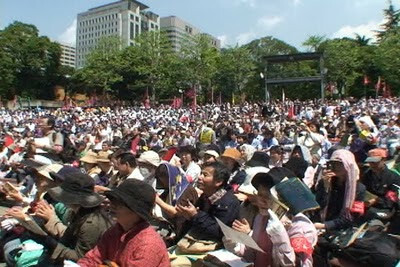 More than 1,600 people came to a 5.3 rally in Tokyo on March 3, the Constitution Day. 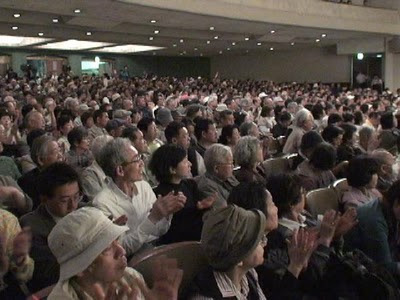 People overflowed the Hibiya Open Air Music Hall with capacity of 1,900 and watched the procession on a large screen outside the hall. 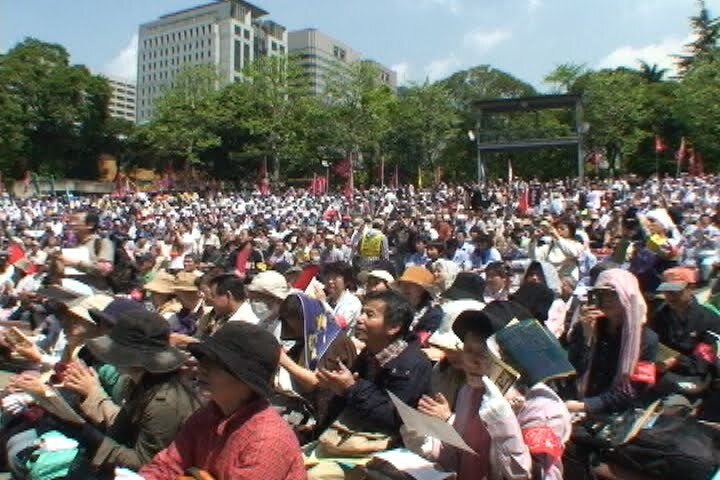 The event of this scale has been held for the past 10 years, and that by itself is proof that people would not allow revision of Constitution. 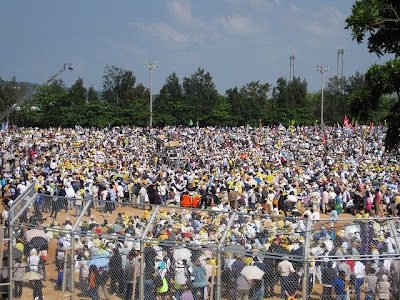 The rally was extremely important as relocation of Futenma base was becoming more political and the government was trying to launch a constitution review committee on the day the law was to be enacted. About 12,000 people gathered at Tokyo’s Hibiya Open Air Music Hall on the sunny May 1 (photo). 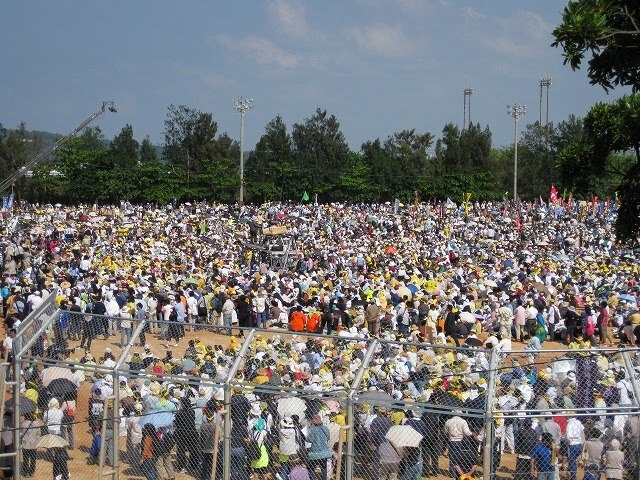 “Okinawa does not need another base,” Social Democratic Party President Mizuho Fukushima said at the rally. 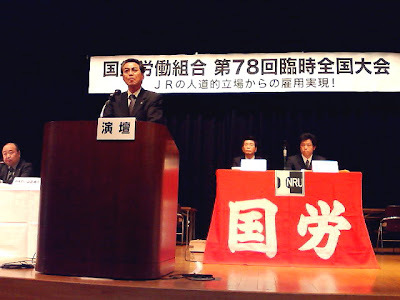 “We should not pound another stake into Henoko.” Narinobu Uehara, who is protesting against US base by withholding a small piece of property in Okinawa, expressed anger by saying, “It’s been 65 years since Futenma base was built. 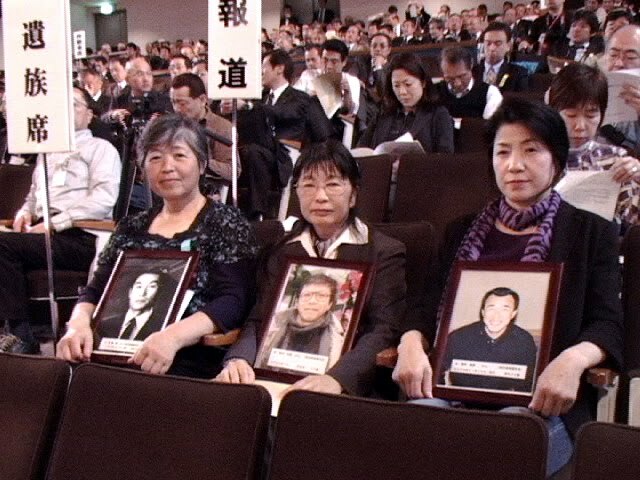 No government should bear 65 years of occupation by a foreign military without a word.” Members of Japan National Railway Struggles reported the result of their long dispute and expressed their appreciation for others’ support. 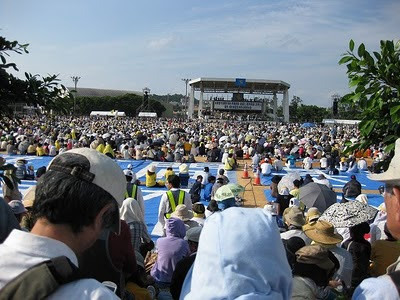 On the same day, some 32,000 people gathered at Tokyo’s Yoyogi Park for another May Day rally led by Zenroren. 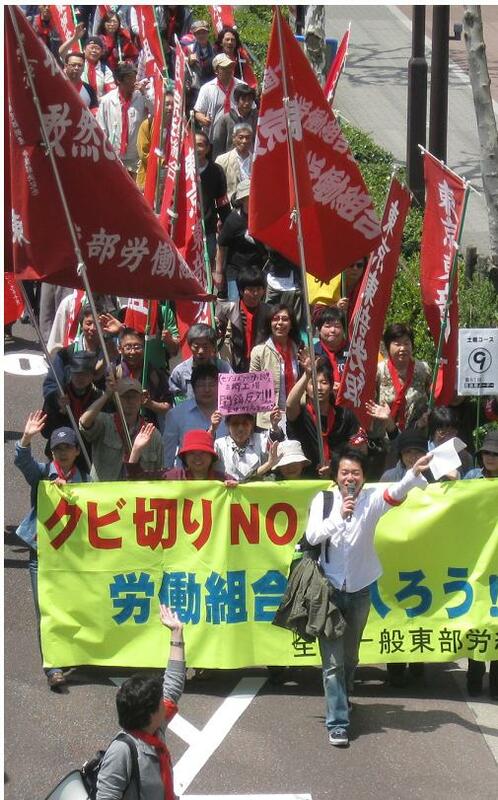 In New York, Democratic Party affiliates celebrated their first May Day in some 10 years. The unemployment rate, which exceeded 10 percent, has added to increasing anxiety over mass layoffs.